But Johnson applied those same principles that helped him develop into one of NASCAR’s all-time greats to a different kind of course — the 26.2-mile 123rd running of the Boston Marathon on Monday morning, only 36 hours after competing in NASCAR’s Monster Energy NASCAR Cup Series night race at Richmond Raceway. Johnson woke up this morning preparing his gear, stretching and doing some laps to get himself ready. Fittingly wearing bib No. 4848, Johnson completed the marathon with an unofficial time of 3 hours, 9 minutes and 7 seconds. That means he ran approximately 8.24 mph (with a pace of 7 minutes, 13 seconds per mile), and according to Johnson, it wasn’t easy. Johnson began the race at 10:25 a.m. ET and hit the 5K mark 21 minutes, 22 seconds later. Pacing himself for the long race ahead, at 1 hour, 31 minutes and 38 seconds, Johnson made it to the halfway point. And now, he has another piece of hardware to add to his growing collection. Former Boston Marathon champion Meb Keflezighi presented Johnson with his medal. 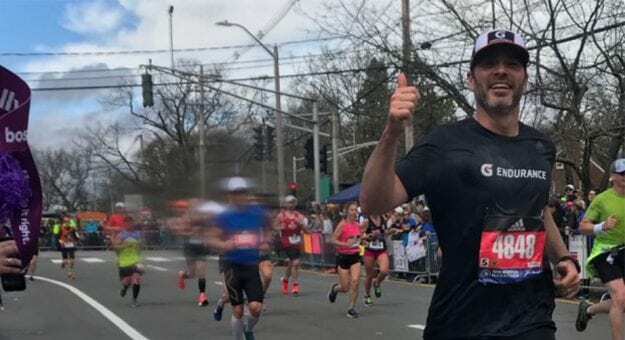 Considered one of the most prestigious marathons in the world, Johnson had been training for his first Boston Marathon for months. An avid fitness buff, he already ran a half-marathon at Daytona Beach, Florida, earlier this season during Speedweeks. 10:25:00 a.m. ET – Johnson started the Boston Marathon but first, he had to take care of some racing business. 11:51:51 a.m. ET – Twenty-two minutes and 16 seconds later, Johnson hit the 20K mark. His total time is 01:26:49.